For over 30 years, well over a thousand families have chosen Markay to build a home for them. Each family has had their own set of unique reasons to make that decision. It's time to step up to a Markay original. Owning one is a certain way to make a statement. A unique private enclave of freehold detached custom homes on 36′ and 46′ lots in the prestigious just north of Lakeshore off Maple near the lakefront park of Burlington. Enjoy easy access to the QEW, downtown Burlington, Lake Ontario and the Waterfront Trail. Register Now to express your interest in advance of our public opening. There is still one place on 16 Mile Creek where you can live next to nature. Where you can enjoy your morning coffee on the deck overlooking the backyard and the cool lush forest behind. Where the sun glints off the sparkling creek as you stroll along the bank. Discover Forest Creek just south of Derry on 4th Line in Milton. 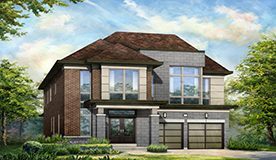 A community of elegant detached homes and executive townhomes now selling in 16 Mile Creek. Where life flows.